« Are Fake Farms as bad as Fake News? One of the predicted megatrends for the future is the rise in Ethical Living. Passport market research, which is part of Euromonitor International, predicts that increasing attention will be paid to ethics and moral values by food citizens and businesses in the coming years. This means that purchasing decisions will be framed by concerns about the environment, sustainability, animal welfare, labour practices, as well as use those purchasing decisions to positively impact communities and people. Right now, it feels like the dairy industry is like a pendulum swinging from one extreme to the other. It swings one way towards a rise in the intensification of the dairy farming with larger herds of cows kept indoors, rarely seeing a blade of fresh grass. Then to the other extreme where lifestyle trends see people cut out dairy all together. 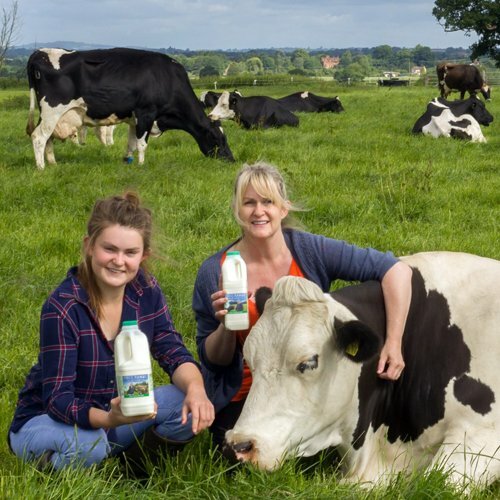 However, in the middle there are solutions for the ethical shopper looking for a milk which can meet their requirements on ethical choices alongside a great taste. Many people have fallen out of love with milk, as the pressure on farmers to deliver large volumes of cheap white stuff, renders one of nature’s super foods a bland commodity on many supermarket shelves. The dairy supply chain is largely driven by logistics, which means processing, distribution and retailing of our milk is now in the hands of a few big operators. The pressure that this consolidation in the chain exerts on farmers means that our dairy industry is changing. Higher stocking rates per acre of land, bigger farm units and increased output per cow are pursued to achieve economies of scale and keep costs of production down. But, in the pursuit of reducing operational costs the producers and sellers are forgetting that people want milk from cows that graze outdoors. Thankfully Ethical Living or Mindful Consumerism is on the rise. It means that instead of passive consumers taking just 10 seconds or less to pick up a bottle of milk, more of us are becoming active Food Citizens. Asking questions about where our food comes from, but also supporting those companies, whose values we understand and believe in, by buying their products. In the UK, over 93% of the population enjoy milk in one form or another, compared to those 7% who consume none at all. This means a lot of cows are still producing milk which is enjoyed by the general public. We are working to halt the trend towards larger, more intensive types of farms and offer conscious consumers the chance to make a more informed choice about the kind of farms their milk comes from. Farms that have smaller herds. Farms where the cows are guaranteed grazing rights and where no male calves are shot at birth, because each animal has a value along with the milk that’s produced. Demanding a better choice can make a difference. People voting with their purses when they buy milk, will drive change. If you want to enjoy great tasting milk again, with clear provenance, don’t give up on dairy – make a better choice and support initiatives like Free Range Dairy Network and always look for the Pasture Promise logo on your bottle of milk.